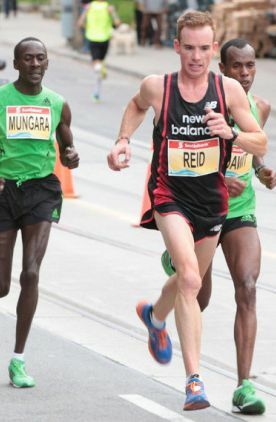 There’s been a resurgence in the elite ranks of Canadian marathoning. Lanni Marchant set a new national women’s record at the Toronto Marathon this year, and in episode 18 Reid Coolsaet, one of the Canadian men stalking Jerome Drayton’s 2:10:08 national mark set at Fukuoka in 1975, discusses his near miss at this year’s Fukuoka race. Elsewhere in the show we reveal a spring marathon challenge to the gents at marathontalk across the pond, and Gregg picks his favorite of our soapbox rants from 2013.